Melonpan (or melon bread): do non-asian people like it? melonpan: do you like it? 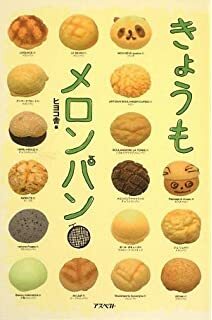 Well, we are in a forum related to japanese stuff, so I think that statistically the result won't be completely fair, but I would like to know your opinion about the melonpan, the sweet japanese bread. Does it taste different to non-asian people? I have seen in many occasions non-asian tourists in Japan walking in front of a store where there was the melonpan, being curious about it and then just walked away, sometimes with a "what is this?" face. I don't want to say that every non-asian tourist is like this, but on the other hand I saw many asian tourist being crazy about it; and not to mention the japanese. The japanese girls in general are crazy about it. Does it taste different to non-asian people? Wouldn't one have to be both Asian and non-Asian to answer that? First, as a concept, it doesn't work for me. I love both bread and melons. I love the subtle taste of bread (good bread that is, not the nasty stuff in Japanese supermarkets) and also the sweetness of melons but the idea of mixing them is really strange. For a Japanese person, an equivalent idea may be pouring melon juice on top of Japanese rice. Second, it's not even melon juice that is added, but some chemical flavouring that smells synthetic and overpowering. Real melons do not smell strong. Note that none of my explanation requires me to be Asian or non-Asian. @Mike Cash, you're right about that part. Wrong concept. In this topic I would like to know your nationality and if you like the melon pan. @Lothor thanks for your opinion. From what i know it's called melon pan but traditionally it doesn't have any connection with the melon for the flavour. Btw have you ever tried it? can I ask your nationality? I have tried it (I wouldn't have called it disgusting if I hadn't tried it!) and I'm a white British male. Do you want to know by nationality or by ethnicity/race? It is hard to tell. just nationality and if you like it, thanks. I am American and I like melonpan. I think it must be made clear here that not all melonpan are created equal. Some professional bakers turn out rather good ones, while the mass-produced stuff is nothing to write home about. To be honest, I really like melonpan. But I also like watermelons and bread so it sort of makes sense lol. Actually, the name "melonpan" is from its appearance, not from the taste or flavor (well, at least regarding the traditional ones). I prefer the ones with melon-cream filling, though. I enjoy melons and bread but as a few has said already, the idea seems horrendous to me. I would like to try it though. I love shrimp and I also love nutella. Does melonpan taste different according to your blood type? well, traditionally there is no combination of watermelon and bread for the melonpan. It's more like a sweet bread. can i ask your nationality? as for every food, i think it tastes different according to your environment and the way you were raised. Meals are the same in every country? French people like pasta the same way as the italians? or just think about the nattou and how many western people usually don't like it. since asians generally like this bread, I'm curious to know if it can fit to western tastes. French people like pasta the same way as the italians? The first point - the French probably like it slightly different. Italians are often horrified by what Japanese people do to pasta (nori, tarako etc), and Britain has curry dishes that are unrecognisable in India, so there's no doubt that dishes evolve when they are adapted by another country. How to adapt melonpan to western tastes - simple! Keep it traditional and don't put in the revolting synthetic melon flavour! - I cannot imagine many people disliking a sweet bread roll with a melon-like pattern on it. I perfectly agree with you for the adapting pattern of a product in a different country. p.s: in my company's bakeries the melonpan is traditional and baked at the moment. (every 15 minutes there are new melonpan in the store). How about putting a link to your stores (if the moderators don't mind) and if one is nearby (I live in Tokyo), I'll buy one! So it's only supposed to have sugar? Haha, I know. I was just joking. The difference is not only in the taste, the body reacts differently to it also. I had a Japanese teacher who couldn't eat a Spanish meal called "cocido" without having terrible stomachaches and I hardly notice my digestion after having this meal. Also, if I had to eat rice with every meal more than a day or two I wouldn't poop in a month. Melon pan comes in many flavors. I have only actually had the watermelon flavored melon pan. Melon Pan shops supply melon pan with no taste of melon so I'd say BS on any shop supplying melon pan that is any different from a slightly sweet bun. This is at least the only melon pan, I have ever had. At my local japanese supermarket in New York, there is quite an assortment of breads, like milk bread, coffee bread, and this melon bread. So at first, I thought the thread meant this. But you learn something new everyday. I suppose the traditional melon pan is just sweet bread (never had that) but there are melon pans with curry, custard or butter flavors (probably more flavors too). I hope it is allowed to show that link. If not, I will remove it or the mods can remove it. At my local japanese supermarket in New York, there is quite an assortment of breads, like milk bread, coffee bread, and this melon bread. Your local Japanese supermarket has a type of bread that I have never seen in any store in Japan ever. Googling watermelon flavored melonpan reveals nothing later than 2011 and indicates that Yamazaki used to make it a few years ago but has since ceased production. (Limited production and/or distribution aren't unusual here). there are melon pans with curry, custard or butter flavors (probably more flavors too). I'd love to know where you see these. I've never run into them on sale in any Japanese supermarket, convenience store, or bakery. I wouldn't be surprised to hear that some specialty shop has such things, but they would be rare. Sure I will go to my local supermarket and see if they sell it today. If not, I will at least get the brand that sells it. For the other flavors, that was something I found from a simple google search, although I could not tell you if these flavors are currently in commission or not. I didn't know people want to eat multiple flavor melon pan that much. In my opinion it was good at least. When I read the ingredients they use "powered juice". Although it does not specify whether the juice was watermelon. Honestly, I could be totally wrong about it using watermelon juice. It just taste that way to me but I may not have a palette for identifying flavors 100%. I'm a Japanese, so I can't answer your initial question.